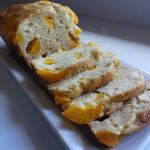 Peach bread is a great dessert or breakfast bread. It also is good at tea-time with coffee or tea. 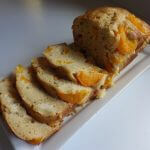 It’s a very flavorful and very sweet bread accented by the addition of orange juice concentrate. 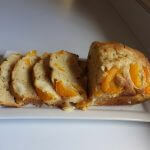 You can either use fresh peaches or canned depending on the seasonal availability of peaches. 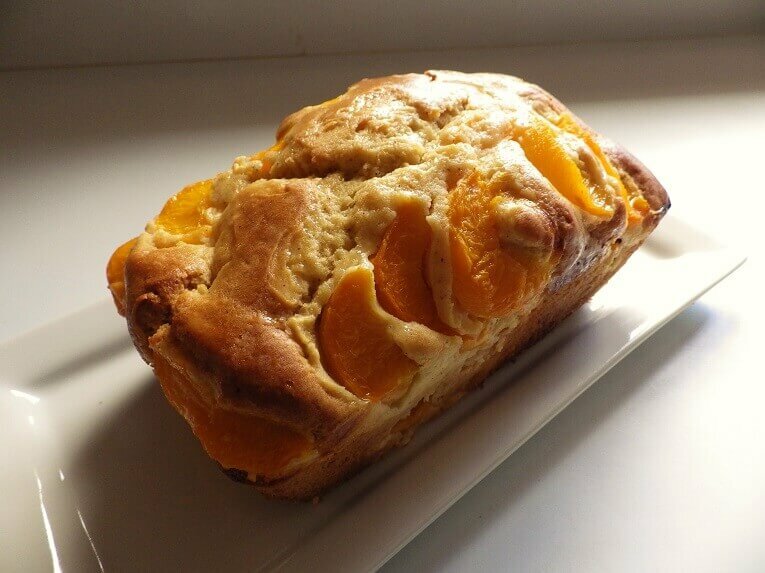 Like many other breads, Peach bread is a batter bread. 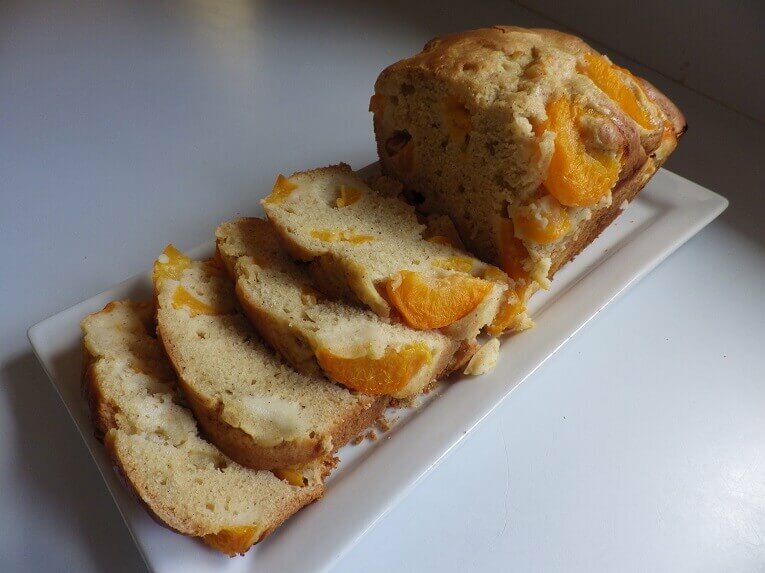 Batter breads are defined by the use of baking soda and or baking powder in place of yeast. The result is a batter-like consistency rather than the dough ball you usually see with a yeast bread. What’s important to remember is that a batter bread will not rise before baking. Batter breads rise in the oven towards the end of the baking cycle. As a result, you need to find a setting on your bread machine that does not have a rising cycle. 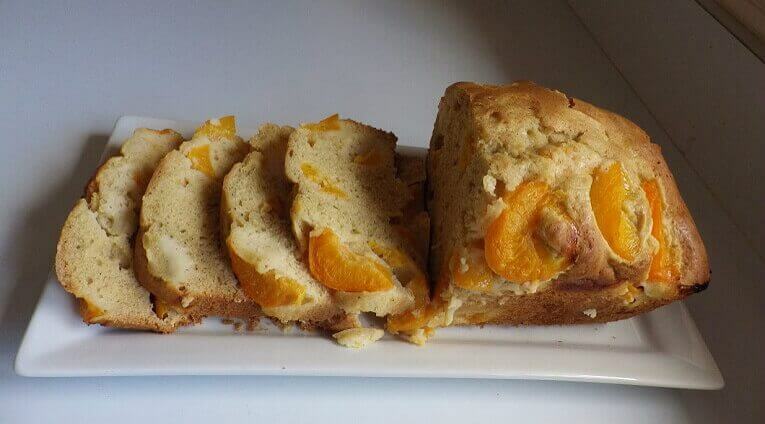 If you have a cake bread setting you’re in luck. 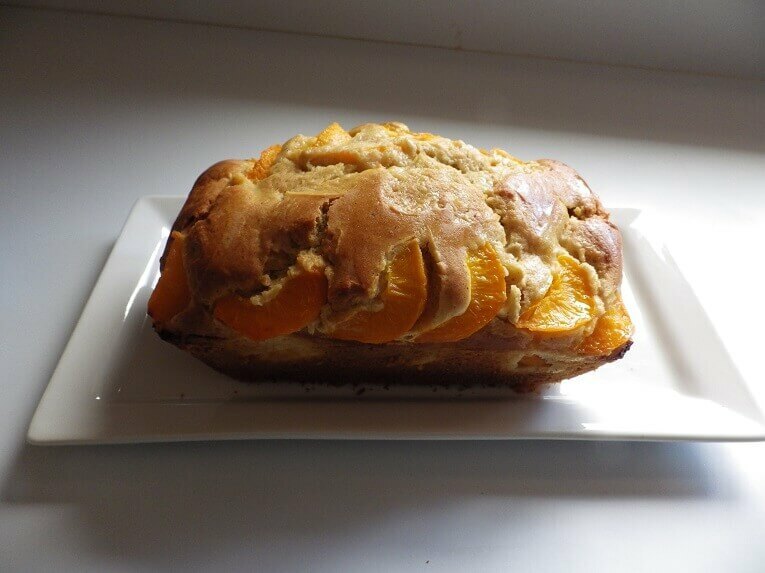 You can make the entire Peach bread from start to finish in the bread machine. 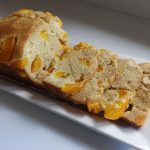 If you only have a cookie dough or pasta dough setting you can use on of those setting to mix your batter, but you’ll have to finish the bread in a conventional oven. If you have a basic dough setting that could work too but the basic dough setting has a rising cycle towards the end of the setting, so you’ll have to pour out the batter before the rising cycle begins. If you finish in the oven use a glass, Pyrex bread pan. Glass bread pans are more forgiving due to the high heat and duration needed for most batter breads. Another tip is to add the peaches by hand to the batter after it is mixed. 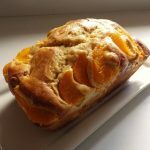 The kneading paddle of the bread machine can tear up the peaches so blending them into the batter is easier and keeps them intact. Also, save half of the peaches to top the batter right before baking. 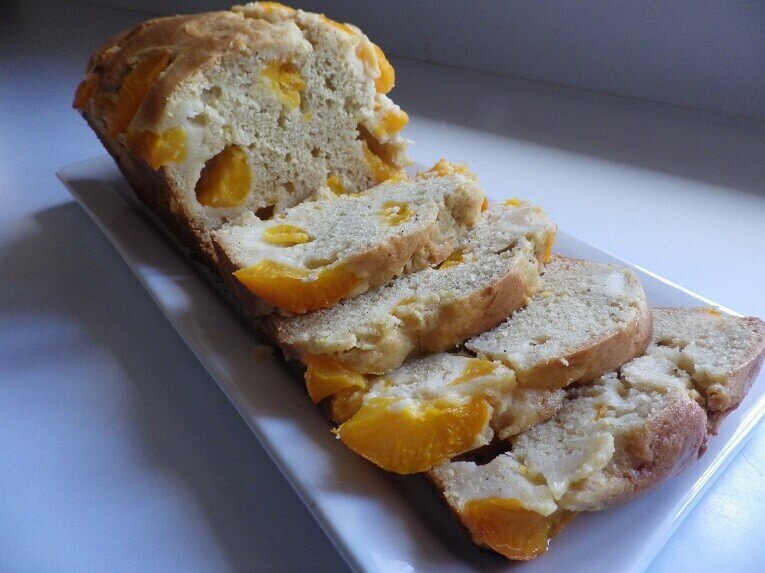 Place all of the ingredients into the bread pan of the bread machine but reserve the peaches. Select a dough or batter setting that does not have a rising cycle like a cake bread setting, or you can use a pasta dough or cookie dough setting to mix the batter and finish in the oven. 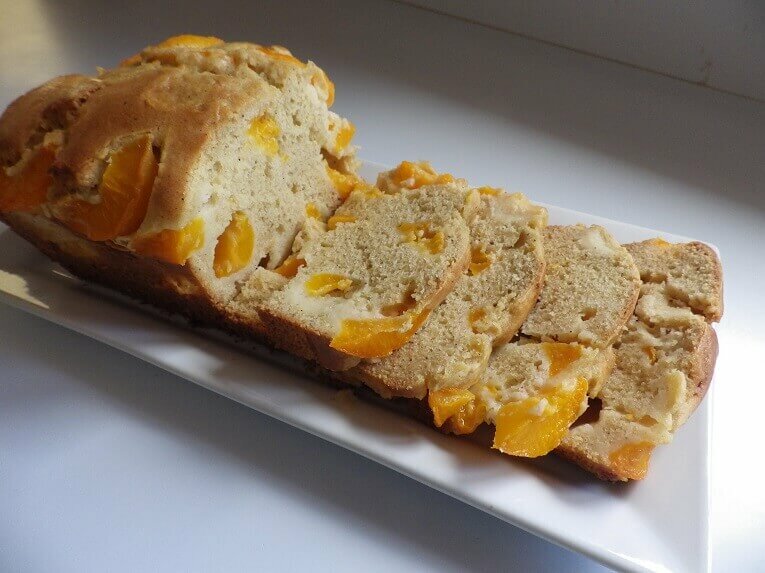 If using the cake bread setting, add half of the peaches after the mixing cycle is complete and before the baking cycle begins. Blend in the peaches gently with a plastic spatula. 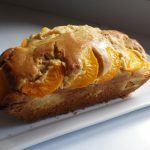 If you are using a pasta dough or cookie dough setting, pour the batter into a buttered, Pyres bread pan and then add half of the peaches to the pan and gently incorporate them into the batter. 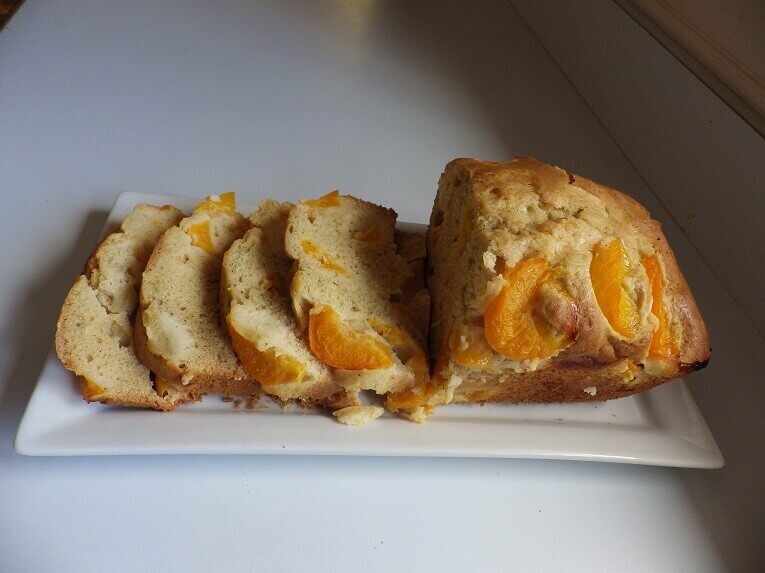 If the batter is too firm, add a tablespoon of peach syrup to loosen the batter up a bit. The batter should have the consistency of a very thick pancake batter. 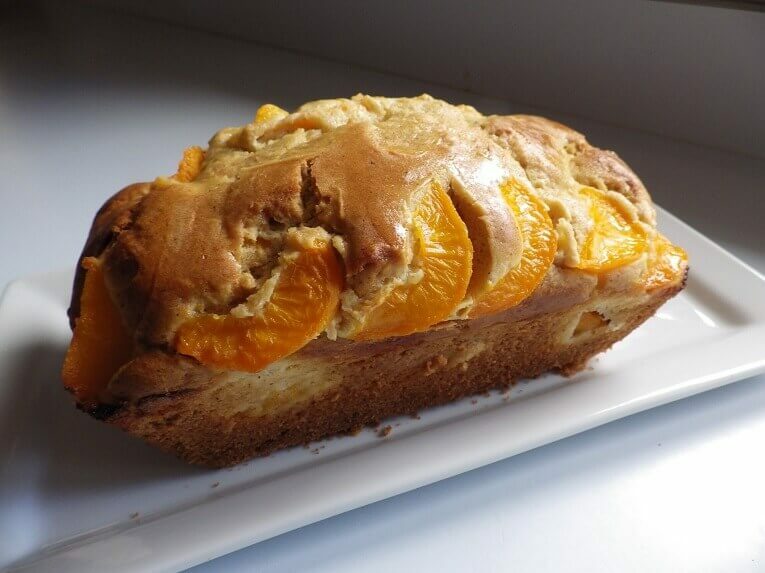 Regardless of how you finish the bread, top the batter with the remaining half of the peaches before baking. If baking in the oven, place the bread pan on the center rack and bake for 60 minutes or until a toothpick inserted into the center of the loaf comes out dry. If wet, continue baking for another 10 minutes. 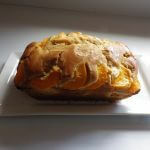 Let the loaf rest in the bread pan for 10 minutes and then remove to a platter and glaze the finished loaf with the peach syrup, slice and serve. What type of flour was used?